Rory McIlroy will have a busier early-season schedule in 2016 than previous years as he aims to reclaim the world number one spot before the Masters. Northern Irishman McIlroy, 26, has dropped to three in the rankings behind Jordan Spieth and Jason Day but the margin between the top three is small. 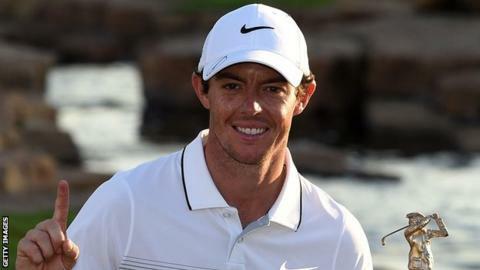 "If I can get off to a good start next year, I can get back to number one going into the Masters," said McIlroy. "I'm going to play two more tournaments leading up to Augusta in April." McIlroy played five events before this year's Masters, where he finished a career-high fourth at the event as closing rounds of 68 and 66 left him six shots behind American Spieth. His 2015 campaign began with two of the European Tour's desert swing events - the Abu Dhabi Championship and the Dubai Desert Classic - before he competed in the Honda Classic, the WGC Cadillac Championship and the Arnold Palmer Invitational in the US. "I need to feel I'm right in the middle of the season at Augusta," added McIlroy. "Over the last couple of years, I've played pretty well at Augusta but I've got off to a little bit of a slow start each time. "Whether that was because I was a little bit under-golfed, that definitely won't be the case in 2016." McIlroy still needs the Masters to complete a career Grand Slam, but with Spieth and Day having won three of the four majors in 2015, he said he will be one of a "number of storylines" going into the first major of the year. "I'm not going to be the only narrative going into Augusta."